After months of deliberation, consultation and speculation the French Assembly has finally voted yesterday to ban the burka in France. All 336 MPs present but one voted for the ban. The law could be introduced as early as September 2010 if the Senate also backs it and France would therefore move a step closer to becoming the first democracy to ban women in the street from wearing a burka or a niqab. It is believed, at this stage, that the Senate is unlikely to take a different view and will vote for the ban as well. However, the ban which would prohibit the wearing of the burqa in all public places including cafes and parks could be facing a legal challenge given that there is no constitutional basis for a total ban in public places. According to a recent poll, over 80% of French Nationals were in favour of the ban including a large percentage of the 5 millions Muslims population in France. It is worth pointing out that out the considerable French Muslim contingent, only approximately 2,000 are thought to be concerned. 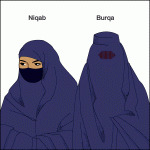 A burka ban will mean that anyone wearing the burka in public could face a fine of 150 euros (£120). In addition, any man forcing a woman to wear a burka or a niqab could face a year in jail or a 30,000 euros (£25,000) fine. Even though the ban went unchallenged in the parliament by the socialist opposition, the socialists believe that the ban should be applied to government buildings and services, in which case the law would probably have a better chance of surviving a challenge in court. I agree with the socialists that a ban in public places and public transport would be more effective. How is a veiled woman going to be challenged in the street - there is not a policeman at every corner and it will be a waste of resource and might generate tension.